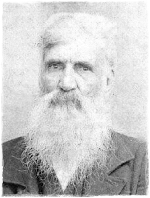 William Lane Wallace was one of the more colorful of the Wallace characters, spending a great deal of time in trouble with the law and rumored to have fathered children by multiple women. He was involved with numerous court cases with Delphy Lakey, Elizabeth Smith & Mary Davis in the early 1840's and it has been passed down through his descendants that he was living with all three and the court finally ordered him to marry one of them. He married Elizabeth Smith. He fought in the Civil War and eventually moved to Dillon, SC. He is most likely a son or grandson of Everet Wallace. [S1027] Buddy Altman [baltman480@aol.com], 02 Apr 2002. William L. Wallace born May 13, 1811, died May 6, 1886. Confederate States Army, Moore County NC PVT COH26 REGT NC INF. He is buried in the St. Paul's Methodist Church cemetery in Little Rock SC (Six miles out of Dillon SC) His wife, Annie E. Wallace is buried beside him. The only child of his that I know is Arrie Lane Wallace, my great grandfather. I know at one time the Wallace's were the largest land owners in Dillon County SC, but I hear women, gambling and booze got most of it. I know on my side, the Altmans came from Harnett County NC. There is also an Arch Wallace, born 3/15/1865 - died 7/17/25 and an A. E. Wallace, born 6/11/1839 - died 10/09/1893?Great news, found a brief history somebody had written. It says William Lane Wallace move to Hamer SC in 1865, why is not known, Married Annie Elizabeth Smith Wallace in 1845 in Carthage NC, he had previous been married to her sister, who I believe had died. They had 10 children, William, Evert, Thomas, Arrie Lane, Needam, Royce, Archie, Missouri, Mary, and Suzannah. Which one is your nearest relative? He enlisted in the CSA army at the age of 50, June 6, 1861 in Carthage NC. An interesting fact is that he was admitted to a hospital with hepatitis 3 days before his unit was nearly wiped out in a severe battle. Also on his tombstone is the inscription "We cannot tell who next may fall - Beneath Thy chastening rod - One must be first but let us all - Prepare to meet our God - On Annie Elizabeth's Tombstone, Angels watch her sleeping - Til Jesus comes to raise the just - When may she wake with sweet surprise - and in her Savior's image rise - It also says that his name appears on the CSA Army "Roll of Honor", and that he was hospitalized for hepatitis on 7/3/1863 at Chimborazo Hospital, an August 31 he was transferred to General Hospital in Richmond VA and later transferred to Winder Hospital. [S1028] Sara Payne [sarmar@prodigy.net], 02 Apr 2002. His name was definitely William Lane. No, we are unsure of birthdate also -- we have records of 1811 and 1814 also. The marriages are truly a mystery also. William Lane had a son Arrie (Ira) Lane who had a son Owen Lane who was my grandfather. To the best of my knowledge almost all of the younger of William Lane's children moved to Dillon Co. SC with him. Once again, I will have to double check all of the dates. Can't remember WHY they moved to Dillon Co, will check w/ some old folks about that. We know now that William Lane was pretty much of a rounder - that seemed to stop with the bunch who moved to Dillon. They were law-abiding citizens. Arrie Lane was the first court bailiff when the county was organized from Marion/Marlboro Counties. When Arrie Lane died, he left a farm and a house to each of his 8 children - would probably be considered "landed gentry." That may be why they moved to SC - to buy land and get property - maybe cheaper than in NC. I have pic of Arrie Lane and his wife in their later years - not a pretty picture! My aunt has just discovered a picture of them when they were first married - a cousin died and left her some family pictures. Of course, I have info on all of Arrie (Ira) Lane's children that I know would interest you. The cemetery at St. Pauls Church in Little Rock, SC has graves of some of William Lane's other children (Susannah, Missouri, Arch - can't remember them all).